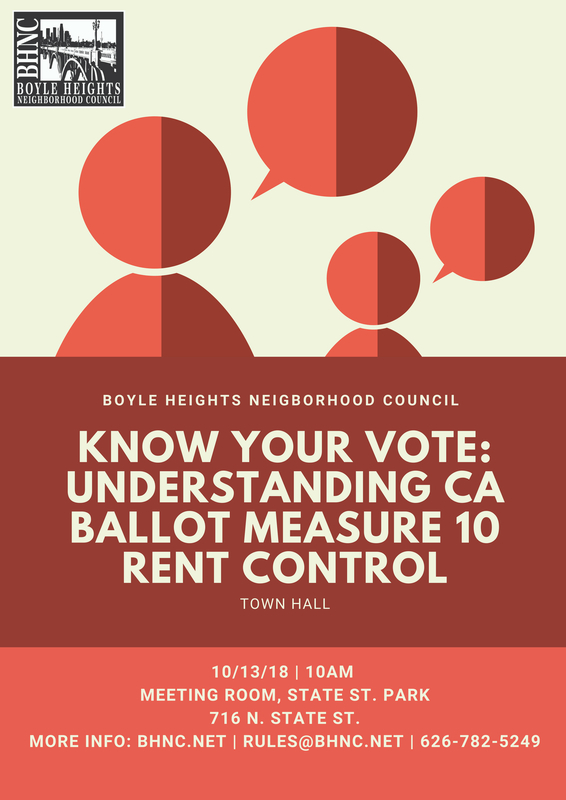 The Boyle Heights Neighborhood Council will host its first voter education town hall on Saturday for residents to voice their questions and concerns about Proposition 10, a rent control measure. The town hall, the first of four this fall ahead of a general election in November, will take place in State Street Park. 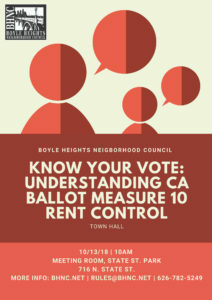 Presenters will explain the initiative and allow residents to ask questions, said Marisol Sánchez, chair of the Boyle Heights Neighborhood Council Rules and Elections Committee. 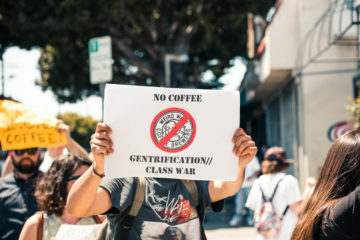 The proposition, which will be on the statewide ballot in November, would repeal the Costa-Hawkins Rental Housing Act, a 1995 law that limits the use of rent control in California. 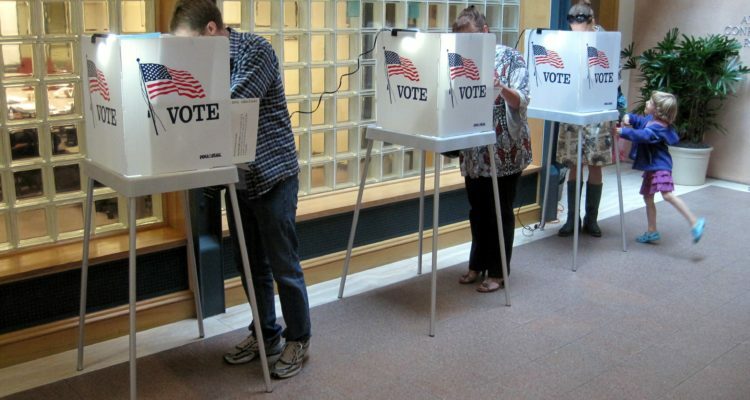 If passed, Proposition 10 would allow cities to establish rent control — preventing landlords from significantly raising prices when market demand goes up — for more recently built housing units, as well as condominiums and townhouses. Los Angeles’ city ordinance prohibits rent control on most apartments built after 1978. 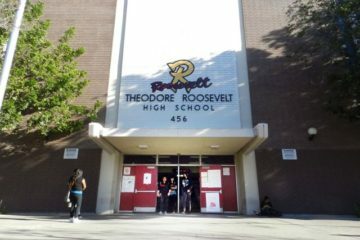 The Los Angeles Times endorsed the proposition in September, stating that cities needed the flexibility to deal with different housing situations on a local basis and decide whether rent control was one solution to California’s growing housing crisis. Currently, nearly 1 in 3 households statewide spend more than half their income on rent, the Times editorial board write, and 15 cities across the state have some form of rent control. 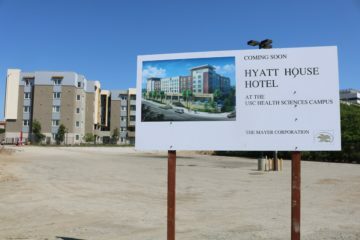 The issue is particularly relevant to Boyle Heights, Sanchez said, because of rising rents and increasing gentrification in the historic neighborhood. Sánchez said she hopes attending the town hall will also encourage residents to get more involved in the community by running for a seat on the Boyle Heights Neighborhood Council, which is hosting elections in April of next year. “If you’re disgruntled about something in Boyle Heights, create the change you want to see,” Sánchez said.